Fire Restaurant at The Park Hotel is doing an organic, seasonal menu that has a variety of dishes that are made using ingredients sourced directly from farms around town – and yes, they’re delicious! The idea was to give back to the community and serve food that’s fresh, organic, and produced sustainably. The solution? Reduce the food miles (how far a food item is transported during the journey from the producer to the consumer) by sourcing fresh ingredients through local farmers and bringing about an authentic farm-to-table experience in the process — head chef, Abhishek Basu, along with his team at Fire Restaurant did just that. Working with local farms like Tijara Farms, AK Farms, Original Indian Table, Krishi Cress to name a few, they’ve made their menu that’s over 80% organic—and they’re working towards going 100% earth-friendly. The menu at Fire changes seasonally based on what local farmers produce and provide them. 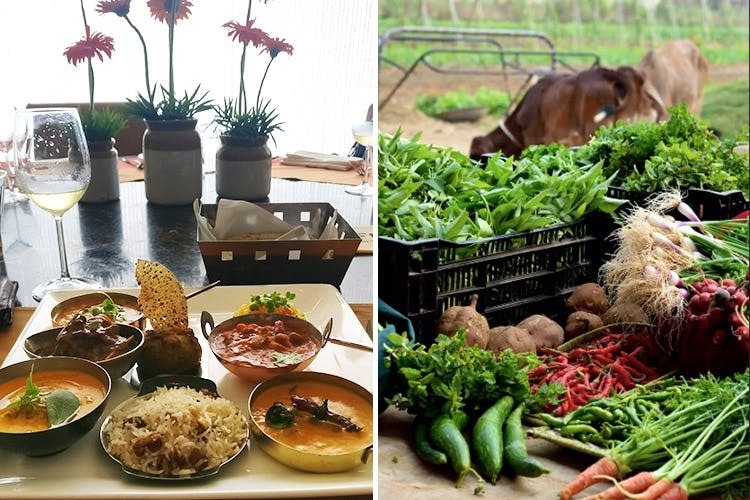 They also host Delhi Organic Farmer’s Market every Sunday at The Park where local suppliers set up shop to sell their fresh produce, so if you’re looking for a place to source fresh ingredients, head over here this weekend. With a menu full of salads, starters, main course, breads, and desserts, you’ll find a whole lot of regional dishes. We absolutely loved the Bhutte Ka Tees Taco made with peanuts and avocado chutney and the Murg Neza Kebab for starters. For the main course, the Mutton Dhansak, Munsiari Rajma Masala, and Thanjavur Manga Curry along with their signature 9 grain roti took the crown. The Jamun Cannoli was our favourite dessert. If you’re in the mood for a fresh farm-to-table experience, try the seasonal menu at Fire Restaurant! It reinforced our belief that organic can be delish too.